To impress the girl he has a crush on, Kouichi (a high schooler) lets her use his address in a gay ad. Soon, a reply comes, and Kouichi finds himself meeting with the man he made a joke of, intending to reject him. But he was surprised to find out that the man is actually a teacher in his school! Hirokazu is a really nice man. He seemed so lonely that Kouichi just couldn’t find it in himself to hurt him. One date leads to another, and Kouichi falls for his teacher for real… the problem is, Hirokazu doesn’t know that Kouichi is a student at his workplace. Very sweet story and so well translated! Even though it's not a very long story, the chapters are not short. The story has a slice of life feel and the romance develops at a slow even pace feels very realistic. Sleeping Bunny is a sweet short story in which the Author surprisingly managed to draw a complete plot and flesh out the characters very well, despite the minuscule amount of chapters. 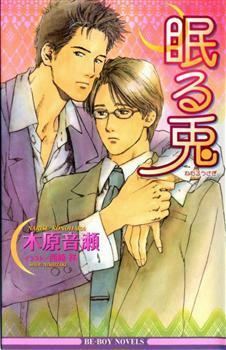 The story is also very realistic, free of fantasy factors and properly narrate the love story between men in the current world. The reason why this novel doesn't become more popular is probably because the premises and characters are quite cliche. But I consider all that as less significant than the author's narrative, thus the 5 star rate. It's an OK story. I would have liked it more if there were one or two more chapters before the epilogue (ala slice of life, no angst needed) about their lives after high school graduation. As it was, although it was a happy ending, it felt incomplete. I thought the best friend would have made an interesting side story. Generally if you are looking for a sweet story to read, this will fit the bill. This story is heartwarming and the realness of the situation is what catches me here. This is truly a great read.